The last we heard from Toronto unit Beams, they were delivering a cover of Kate Bush's "Running Up That Hill." Well, they're keeping the theme on track with their latest single "The Way We Run," and Exclaim! has got the premiere of the brand new accompanying video. The clip was shot in Toronto, featuring recognizable landmarks like the crumbling Gardiner Expressway and the Gooderham Building. After a series of stunning establishing shots, we follow the band on a bike-propelled journey through graffiti-tinged alleys armed with scuba masks, a sleeping bag and some fluffy friends. 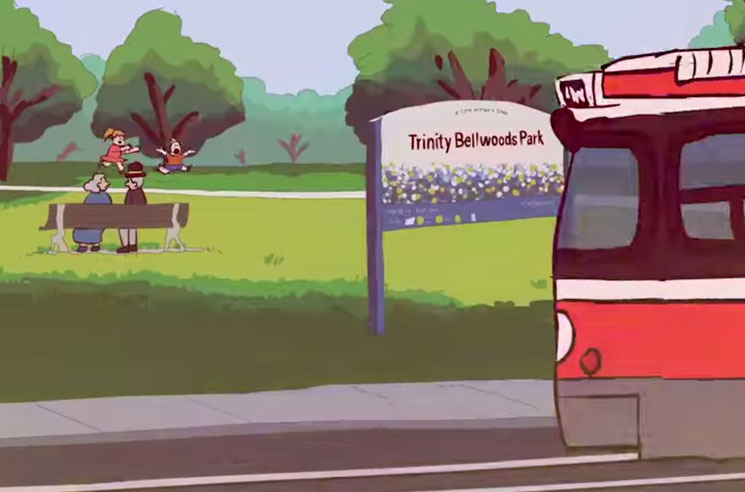 But when the band get picked up in a mysterious white van, things take an animated turn and we see some nicely illustrated shots of the Dakota tavern, the Toronto Island ferries and Trinity Bellwoods Park. Hop in and join Beams on their ride through the city by watching the video for "The Way We Run" in the player below. The track originally appeared on the band's The Gutters & the Glass 7-inch single, which was released earlier this year.